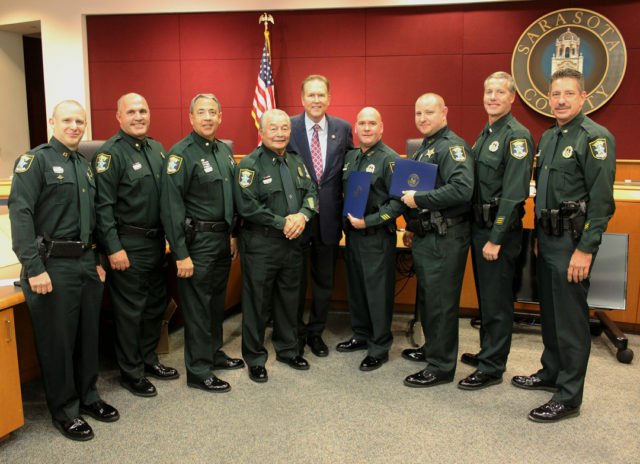 During the Fifth Annual Congressional Law Enforcement Awards presentation, held April 22 in Sarasota, U.S. Rep. Vern Buchanan, R-Longboat Key, recognized several members of the Sarasota County Sheriff’s Office, the office has announced. Lt. Johnny Yong, who began his career at the Sheriff’s Office in 1982, received the Career Service Award, and both Sgt. Donny Kennard, a 19-year veteran of the Sheriff’s Office, and Det. Jason Friday received the Dedication and Professionalism Award. Yong was honored for his efforts to educate fellow law enforcement officers about handling heroin overdoses, including how to use auto-injectors of naloxone, a news release says. Kennard was recognized “for his outstanding work in retail fraud theft investigations in Sarasota County,” the release adds. 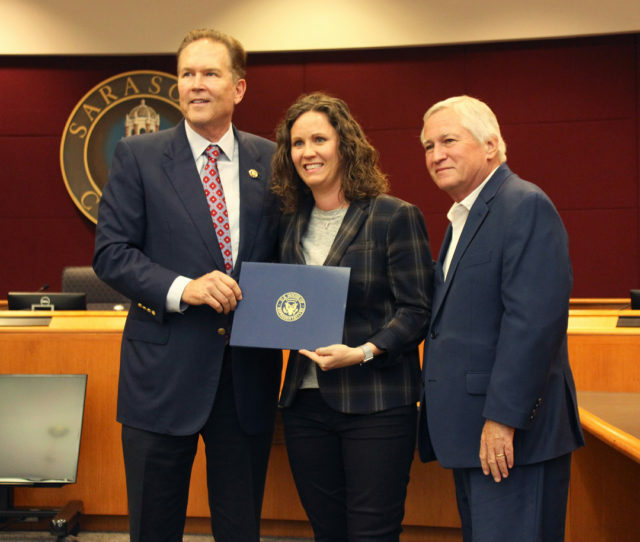 Pastor Jim Minor and Executive Director Erin Minor of Harvest House Sarasota won recognition, too, during the ceremony, the release continues. Members of the Sheriff’s Office nominated them for the Congressional Associate Service Award, the release points out, explaining that Harvest House is a housing and homeless services organization “dedicated to the premise that all people deserve safe, stable housing, and opportunity.” The release adds, “Harvest House has been a pioneer in the transitional and permanent housing movement,” having purchased neglected apartments “to create vibrant, affordable housing specifically for homeless families.” The nonprofit also offers services on-site to help homeless people achieve more stability in their lives, the release says. Harvest House “has played a critical visible role in improving relations” between the Sheriff’s Office and the community, the release points out. “Not only has crime been reduced, but effective social programs have been put in place to help families deal with problems that, if not addressed in a timely manner, could lead to criminal activity as well as personal or family dysfunction,” the release adds. Assigned to the Corrections Bureau, Yong supervises a staff of three sergeants, 38 deputies and nine civilians, the release continues. “He is responsible for the care and custody of more than 900 inmates and has positively impacted the lives of several of them by encouraging them to earn a clean, drug-free and honest living,” the release says. “Yong also actively participates in Camp X-RAYD (Examine Realities About Your Decisions), a program that provides at-risk youth with information and experiences to help them make choices that lead to improved health with productive, law-abiding citizenship, the release notes. Regarding Kennard: The release explains that as people in the community began seeing an increase in heroin overdose deaths, he collaborated with community partners and organizations including the National Association of Drug Diversion Investigators (NADDI), in which he serves as vice president, in creating the lesson plan for law enforcement officers administering naloxone to treat overdoses. He continues to travel around the state to provide training to other law enforcement agencies implementing naloxone, the release adds. Friday led Operation Skimmer Sweep, which inspected 78 gas stations, with more than 450 gas pumps, to educate station owners so they could help identify and confiscate several skimmers installed in Sarasota County, the release explains. He is working on a federal prosecution of a large Haitian-based organized retail crime group “that reaches as far as Georgia and Alabama, as well Florida counties outside Sarasota, such as Hillsborough, Polk, Pinellas, Miami-Dade and Brevard, the release notes.